Help your Clients to see their ROI (Return on Investment). Usign the PCMK™ Coaching Kit along with the Client's CLI Learning & Development Plan provides the means for your Client to recognize the ROI that they have achieved through your coaching engagement. PCMK™ Coaching Kits are packaged in a poly envelope and they include the 'PCMK&#153 Coaching Journal' with movable page markers, 'CLI Values Cards' and the 'Client Information & Coaching Partnership Form'. When you order 10 or more CLI will insert your single page BIO (for CLI Enhanced Licensees only) as the first page in the coil bound book in the Kit. Help your Clients to track their progress - Whether you are coaching by phone, internet or in person. 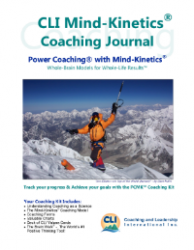 This kit explains Models & Theory plus supplies your client with Power Coaching worksheets plus The Brain Walk Peace, Stroll & VA for home use between coaching sessions. Order in minimum quantities of 10 to receive your customized versions - Customization may include your company name and coordinates printed on the front cover in standard colours and fonts to blend with existing packaging. Coaching and Leadership International Inc. ©Copyright 2019 Coaching And Leadership International Inc.